I paint a lot of tabletop miniatures. That should not be a surprise to anyone who has glanced at my posts on Twitter or visited my Flickr account. Like many of tabletop games, the two stalwarts of my gaming have long been from the Warhammer 40k and Warmachine universes. Recently however there has been another game dominating my playing time. 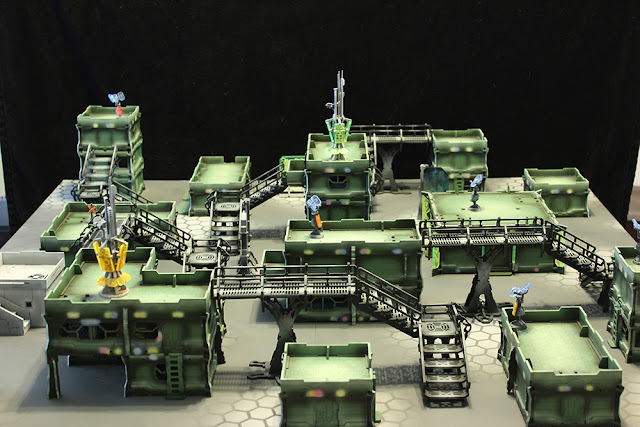 Infinity by Spanish outfit Corvus Belli is a science fiction skirmish game that focuses on smaller forces and faster games. It has an anime inspired style, and uses a slightly smaller 28mm scale. The beauty of the game though comes from the rules. The combination of objective based game-play and the ability for every unit to react to the action of others means that it plays out in a very dynamic manner, and the games and usually close. It's one of the few games that manages to keep things balanced and interesting even in games where you might have been out-played, or just plain unlucky. It poses lots of interesting questions to its players. The factions each have some distinctive character without needing to have a whole slew of complex rules or dependencies (as you see in Warmachine). Each gets its flavor from the types of weapons and tactics that are available to it. It also plays better with lots of scenery, usually urban areas. While it makes set-up a little more involved, it creates so many more interesting situations in the game, and line of sight and movement become all the more important. I can't recall the last time that I was quite so captivated by a miniatures game. I've already branched out into a second faction, and contemplating a third. That's usually a good sign!